Now that we now what the design consists of, it is time to make it happen. Before a plant goes in the ground, we believe in taking the time to craft the soil to suit the particular variety of plant being installed. 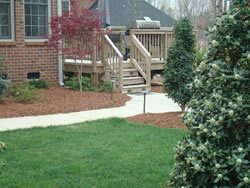 With the soil crafted to perfection and the right plant chosen for the right location, we are able to provide a One Year Plant Replacement Guarantee not equal to any landscape company in the triangle area. This means you can relax and enjoy your new landscape during the entire establishment period knowing we are one phone call away from answering any call to service you may have.